Today is International Women's Day, which recognizes the social, economic, cultural and political achievements of women. 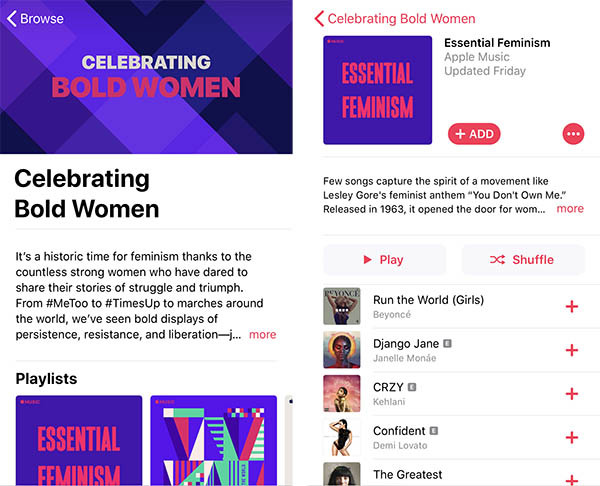 Apple is celebrating the day by highlighting a selection of songs, movies, TV shows, books, and podcasts created by, about, or inspired by women across Apple Music, iTunes, and iBooks, as it did last year. Look for featured banners in the iTunes Store or tap on the Browse section in Apple Music. Apple CEO Tim Cook also tweeted a quote from Malala Yousafzai, a Pakistani activist for female education, as mentioned in her autobiography I Am Malala. Yousafzai became the youngest-ever recipient of the Nobel Peace Prize in 2014 at the age of 17 for her struggle against the suppression of young people's right to an education. 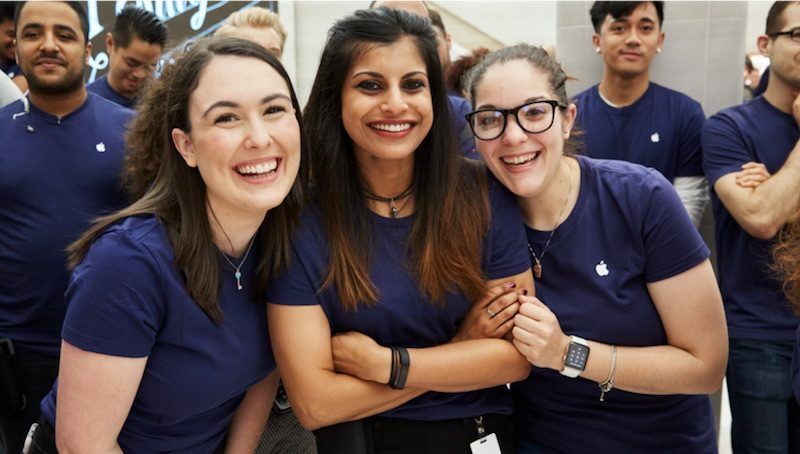 Apple has also been hosting Today at Apple sessions in Singapore in celebration of women who inspire the community, and at its Marché Saint-Germain store in France tonight, the company will be hosting a recruiting event, billed as an evening of inspiration, participation, and celebration. In addition, there's an Activity Challenge that tasks Apple Watch users with doubling their Move ring today in return for a set of still and animated stickers that can be sent to friends and family members via iMessage. I wonder what would happen if a company hosted a recruiting event aimed at men. What a hypocrite, opportunist and discriminative promotion of "equality", for the sake of marketing. I don't understand that quote. It's saying the third power, "women", is not in the world? And it's suggesting women have their separate type of power rather than swords and pens, presumably men's power? How is this quote for equality? Booooo. Feminism must be brought down, it's a disease. Today is International Woman’s Day. That means honoring the accomplishments of women in this country, and around the world. That doesn’t mean it’s International Hate Men day. Grow up and actually educate yourself about feminism. Stop foolishly believing that promoting one thing automatically means hating another. Equality does not exist yet. Just look at the “me too” movement and the disparity in women’s pay. Why not use this day as an opportunity to actually do some research on the Internet to look at some of the studies about the treatment of women. Instead of just firing off some random hipshot comment like how about a day for men. Don’t you think every day already honors men? One thing in life: You can always count on MacRumors users to deliver unnecessary venom to any thread. In most sectors (especially those representing the most wealth / power), “male” is the default. When companies hold a recruiting event, it is by default an event aimed at men, unless they make a deliberate effort to avoid unconscious bias. If you really want to get rid of “special” women-only events, then work to get rid of all the bias favouring men in the world. Once that’s done, we won’t need special events for women any more. Until then, we do. Men are being put at a disadvantage in every sector. Instead of focusing on gender, why not just open the doors and let whoever is best qualified show up. Women outnumber men in University now; and the wage gap is pure politically motivated ******** for low-IQ individuals to feed off of. Minority group... Rich, you should be ashamed of yourself. I don't understand that quote. It's saying the third power, "women", is not in the world? Malala's has never exactly been known for being smart. Example: she truly thinks that simply criticizing Islam at all is what creates radical Islamic terrorists, mind you not the fact that there are legitimate and widespread fundamental denominations of the religion whose interpretation of hadith and the Quran promotes terrorism. That all said, you're right, the quote when read doesn't make much sense. I think I understand what she was trying to get at, but it's terribly worded. And it's suggesting women have their separate type of power rather than swords and pens, presumably men's power? How is this quote for equality? Shhhh. It doesn't have to actually make sense as long as you feel like it makes sense. Woman and man aren't identical. Never have been, never will be. But seeing what man in the west are slowly becoming, it wouldn't surprise me that there won't be man at all soon. Even in this thread 'testosterone' is being used as an insult. Why? It's a hormone. Nothing more, nothing less. But if man don't have normal levels, they are usually depressed, overweight, low energy, etc. Well, I'm sorry to inform feminists on this forum, but my T levels are normal, slightly above average. I am married, and I know that me and my wife are partners, not one above the other, or anything like that. I have 2 small daughters, and they are healthy little girls. But you can be sure that they won't be raised up to believe in this feminism cr*p.
I did some research, looks like wage gap is a myth, domestic violence around 50/50, more women in University, men under , men under 30 make less money, most suicide are men and the same with workplace deaths. You would think that men actually dying on the job would be more important than sexist air-conditioning but the media only wants to talk about fake news, the real issue it that feminism is cancer.